(Newser) – A Frenchman with an arsenal of weapons and a grudge against his government's immigration policies was detained as he tried to leave Ukraine and launch an assault on the Euro 2016 soccer tournament, Ukrainian officials said Monday, describing it as a thwarted plot for a "series of 15 terrorist attacks." The announcement came as France promised unprecedented security for the soccer tournament's crowds and stadiums, which includes the French national stadium that was attacked by suicide bombers on Nov. 13, the AP reports. 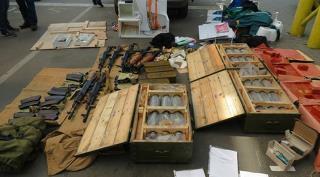 Ukrainian agents had been following the man since December and allowed him to buy five machine guns, two rocket-propelled grenade launchers, 275 pounds of TNT, 100 detonators, and other arms. He also bought 20 balaclavas before he was arrested at the Yahodyn border crossing between Ukraine and Poland last month. the lunatics of islam are triggering the local lunatics... Get ready for deafening screams if any muslims are attacked. Look at all that Soviet made stuff. Big $$$$$ black market in the Ukraine for this stuff. Nice take down!! A simple risk assessment: What do we have to fear more? Managed system of immigration from Arab countries or right wing reactionaries who want to blow up football stadiums to protest immigration policy? To me right wingers pose more of a threat. But that is just rational thinking which is more than you can expect from the Right.